Rangoli is very commonly seen during festivities and has been a constant part of the Indian tradition from time immemorial. But with time, it has gone through many changes not just in patterns but also in the making techniques. One such change is the ‘Kundan Rangoli ‘. 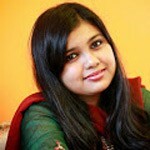 Kundan rangoli is a rangoli that us usually done using stones, different shapes, and decorating objects. These Rangolis can be of any size and can be done anywhere. You can do it on a bright velvet background and hang it, or do it on your wall, or on your floor- the choice is yours. Let’s look at some of the best Kundan rangoli designs. 1. 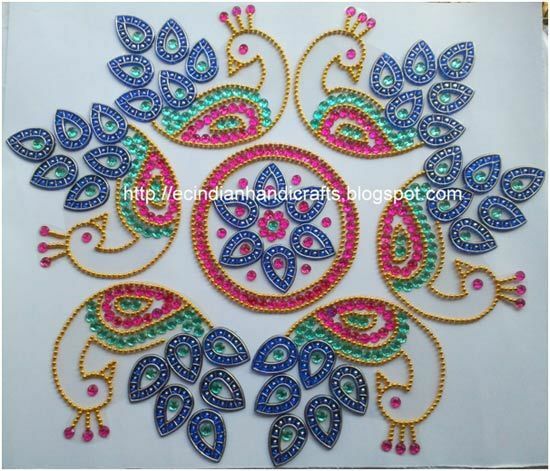 This is a beautiful rangoli design using pearls, blue rhinestones, glitter, and small golden balls. The square middle shape is surrounded by half circular shapes on all sides. The contrasting colours and the use of golden balls and glitter make this design a very classy one to do at your home. 2. This design uses a flower pattern. Bright green circular stones are used to do the design. We can also see the use of golden glitter as well as red glitter tubes to do the intricate designs as well as the border of the Rangoli. In each part of the flower pattern in the middle, five waterdrop shaped rhinestones in red colour are used to make a flower shape. The design is quite unique and will surely give your home a touch of colour. 4. 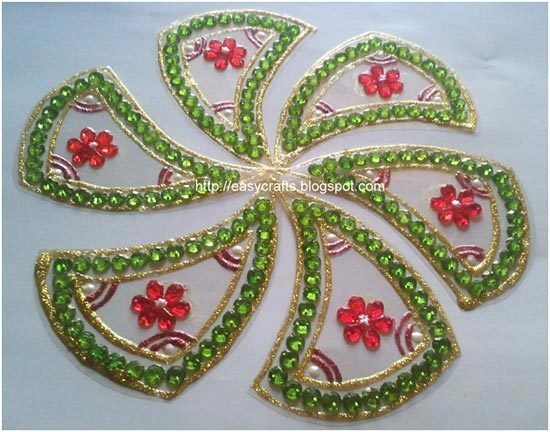 This design among all the kundan rangoli patterns is done using an alternating mixture of Water drop shapes and Mango shaped pieces arranged in a beautiful manner. The contrasting colour usage of pink and green make them look more attractive. 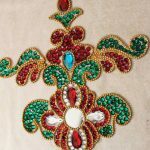 Also the use of white, red and green glitters adds a new dimension to the design. The use of tear drop pearl shapes is also worth mentioning. 5. This is a unique design of the kundan rangoli collection with mainly geometric shapes such as cubes and triangles. 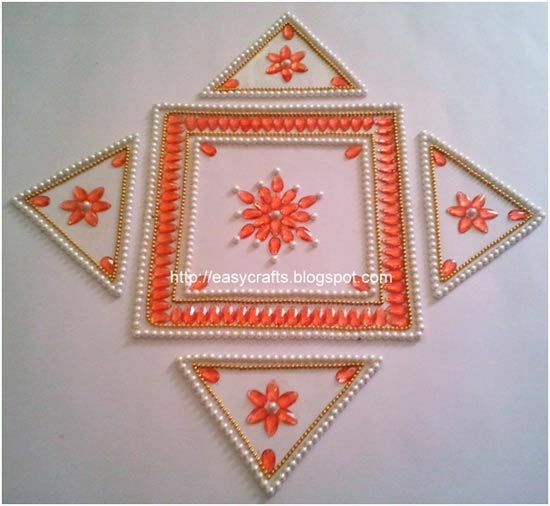 We love the bright orange stones used to make this Rangoli design. 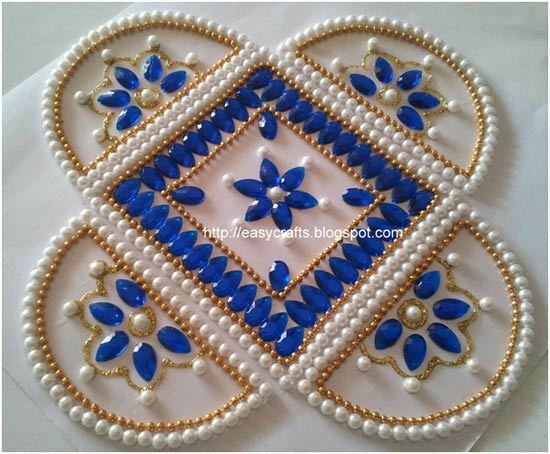 The borders are done using golden beads and small pearl shapes making it look so elegant. This design is apt for any occasion and will look great at any corner of your home. 6. 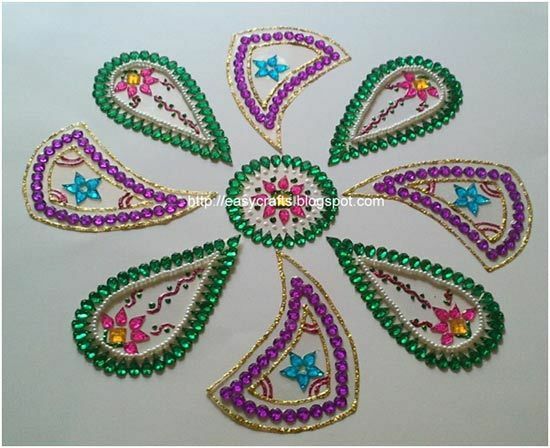 This is a flower patterned design with green and purple beads used to do the different shapes. 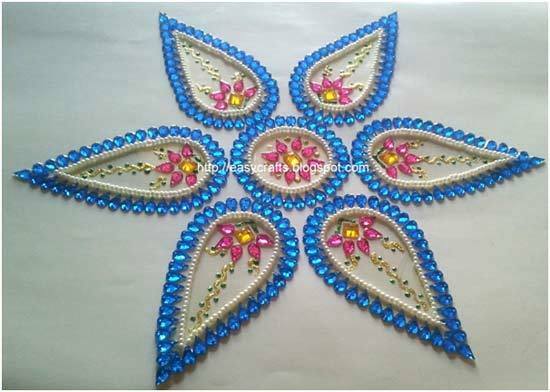 The design also has been decorated with blue pink and yellow beads in different shapes and we also see the use of glitter tubes in green and pink and golden colours. 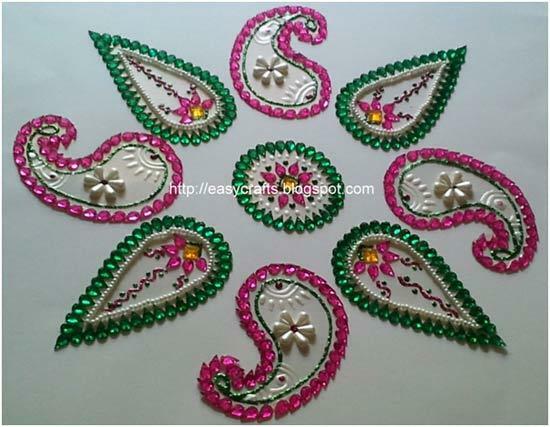 Some pearl teardrop shapes are also used to decorate the whole Rangoli. 7. Off all the old and new kundan rangloi designs, this is my absolute favourite! 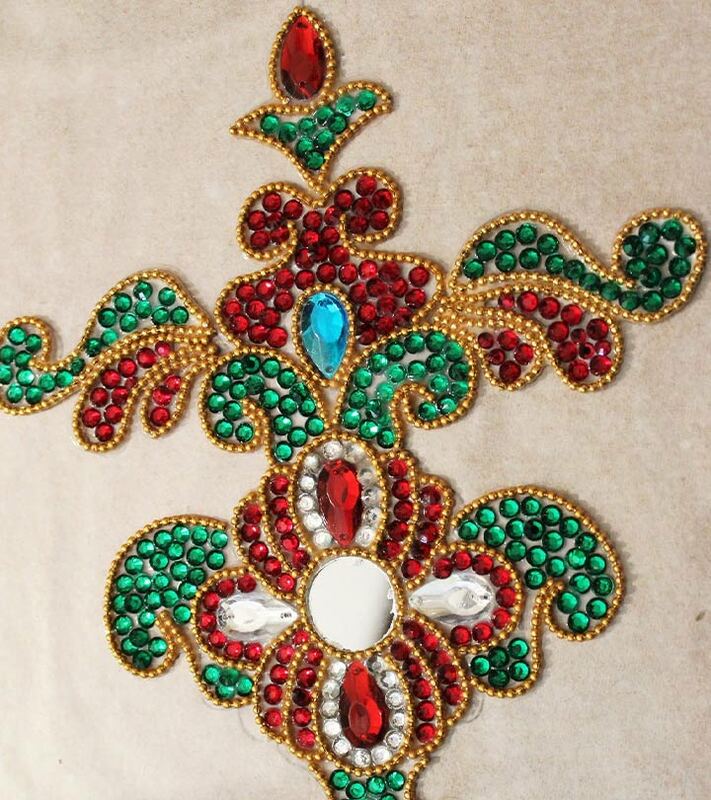 This beautiful kundan rangoli design is very suitable for special occasions and will surely turn heads. We love the different types of techniques used in this Rangoli. Both the floating Kundan rangoli technique and the normal kundan technique have been used. The floating parts are used for the peacock’s feathers and multicoloured beads & an array of different hues make it a great choice for anyone. 8. 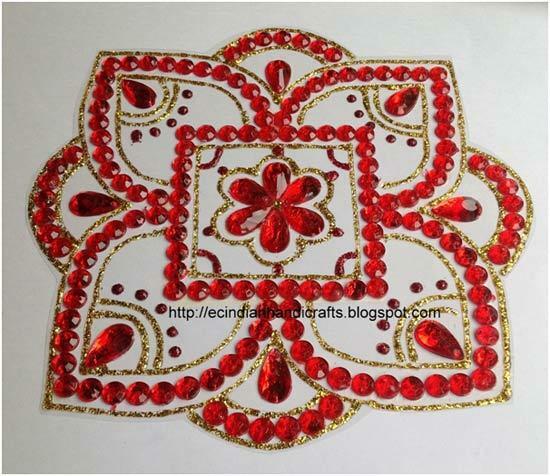 This vibrant red kundan Rangoli looks very beautiful with its bright red shades. We love how the design has used rangoli flower petal shapes as well as geometric shapes while doing the Rangoli. We also love the golden and red glitter used. 9. 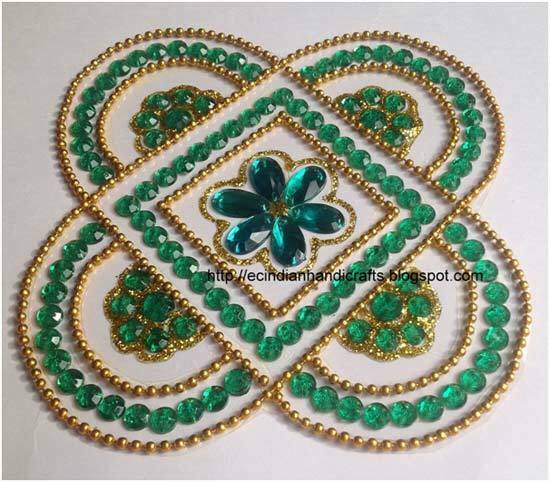 Here is a beautiful and soothing green Kundan Rangoli. 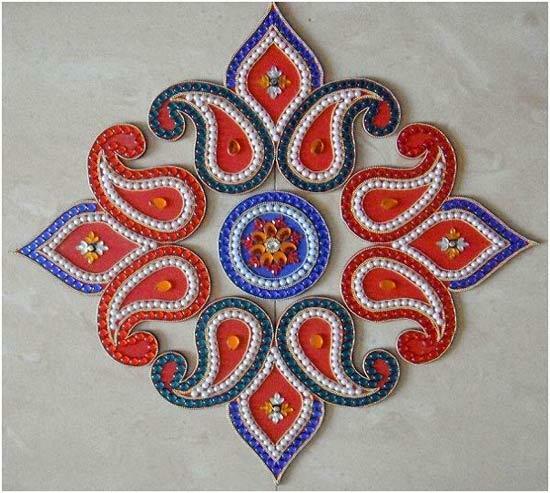 This is quite similar to the design in Rangoli No.1 but the colours are different. We here see green rhinestones being used and golden glitter from the tube has been used to decorate it. 10. A bright blue Kundan rangoli with some hints of Pink and yellow. We love the use of small pearls to decorate the design as well as golden and green glitter to further decorate it. So these were our top Kundan rangoli designs for 2019. We will be back with a new set of designs. Till then, do try these and let us know which ones you are planning to try soon.